Image is for Illustration Only. Actual Item May Vary slightly. American Standard / Trane OEM Variable Speed Motor. 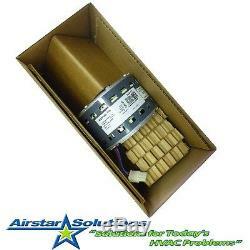 This listing is for (1) Brand New / Individually Boxed OEM Motor manufactured for either American Standard / Trane Air Conditioning and Heat Pump Systems. WE ALSO REPROGRAM OLD MODULES IF YOUR MODULE HAS LOST ITS PROGRAM... THIS DOES NOT APPLY TO SEVERELY DAMAGED MODULES. 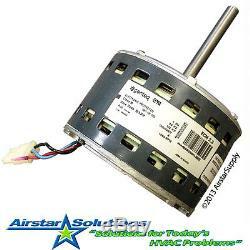 Unsure if this is the right Variable Speed Motor for your system? 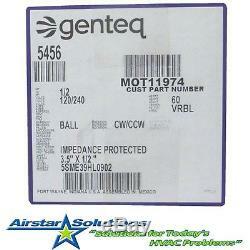 Part #: MOT15032 , replaces MOT11974 , MOT-11974 , MOT-9229 , MOT09229 , MOT-9230 , MOT09230 (Also GE 5456). MOTOR; 1/2 HP, 120-240/60/1, 0-1200 RPM, 48 FRAME, BALL BEARING, SOFTWARE PROGRAMMABLE ROTATION (MODULE NOT INCLUDED). Brand New / Unused / Individually Packaged. Order a Zebra Instruments VZ PRO to help protect from future failures! We will make every effort to fulfill your need and get the item listed. We utilize these services at our discretion. NEXT DAY AIR CUT OFF TIME IS 12:00pm Eastern Standard Time. We also offer local pick-up at our Boca Raton, Location for no additional charge. Check out my other great HVAC & Indoor Air Quality Solutions. The item "American Standard / Trane MOT09229 ECM Variable Speed Motor with Warranty MOT11974" is in sale since Thursday, November 14, 2013. This item is in the category "Home & Garden\Home Improvement\Heating, Cooling & Air\Air Conditioners & Heaters\Central Air Conditioners". 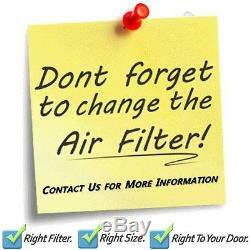 The seller is "hvac_solutions" and is located in Boca Raton, Florida. This item can be shipped worldwide.